Photographs courtesy of Bobbex, Inc. When you think of deer, do you envision a shy doe hiding beneath forest foliage? Or perhaps you imagine a buck bounding through a field along a quiet country road. The reality of where deer like to live is much closer to home than you think. Humans aren't the only species that thrive in suburbia. Today, more deer live in close proximity to humans than ever before in our country's history. "Hunting has reduced deer densities in large, wooded open space areas across the country over the past decade," says Dr. Scott C. Williams of the Connecticut Agricultural Experiment Station. "Many deer remain, however, and are now largely concentrated in residential areas where they have abundant ornamental plants to browse and where little or no hunting occurs." With ample food sources and no natural predators, suburban areas – your backyard – have a lot to offer deer. Deer are extremely adaptive, and while living in close proximity to humans have learned to associate people with food. Many will learn the habits of humans in their area, and adjust their browsing times accordingly to munch on residential landscapes while people are not around, or asleep. Nationally, deer cause millions of dollars in damage by devouring residential landscapes and through vehicle collisions. Estimates range around $1 billion annually, including damage to property, crops and timber. Problems aren't just linked to a high number of deer in an area. Even just one or two in an area can cause significant damage; a single deer can consume a ton and a half of vegetation per year. Physical barriers – Although sometimes unsightly, high fences can keep deer out, but with many suburbs and homeowners associations placing restrictions on fence height, you may not be allowed to build a fence high enough to be effective. 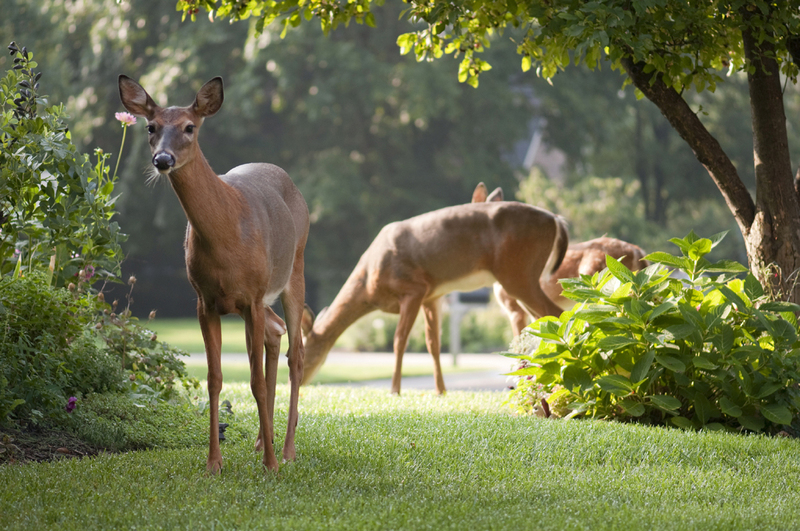 Deer-resistant plantings – Hungry deer will eat just about any type of foliage, but there are some plants that don't appeal to them, such as French marigolds, salvia, foxglove, spiraea, bee balm, boxwood, ornamental grasses and rosemary. Incorporating these plants throughout your landscape might help deter some deer. Motion deterrents – Deer are skittish around unexpected motion, so windsocks positioned near your garden might deter deer from dining there. You may also try motion-sensing sprinklers, lights or even a radio to startle deer away. If these deterrents occasionally work, you'll need to reposition them so deer don't become acclimated to them. Repellents – The most effective deterrent to keep deer out of suburban areas is a scent-aversion repellent, according to Williams. "Our research has proven that this kind of repellent works to protect plants from damage by deer and other animals." Deer rely heavily on their sense of smell for feeding, so using a scent-aversion repellent like Bobbex Deer can be an effective, long-lasting and safe way to keep deer away from your home and landscape. The product's ingredients combine the scents of rotten eggs, garlic, fish, clove oil and vinegar (among other things) to ward off deer, moose and elk from browsing on ornamental plantings, shrubs and trees. 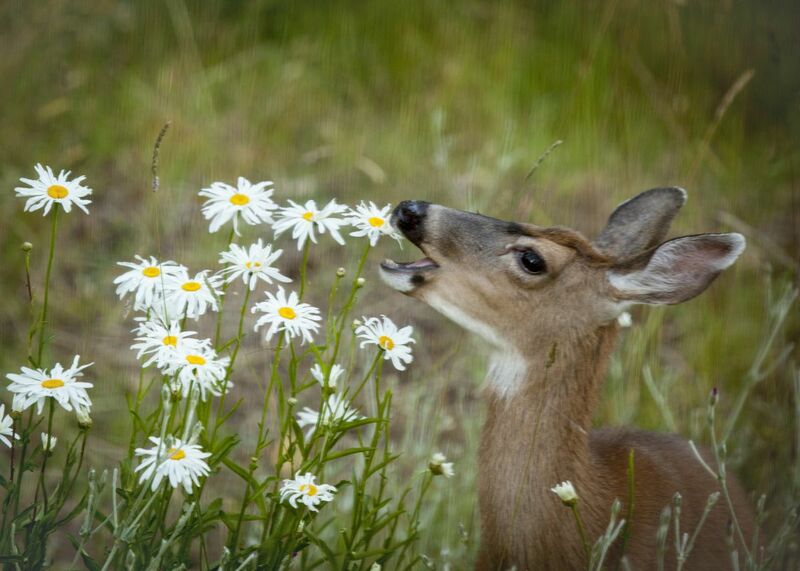 Even if a deer can get past the smell, it makes plants taste unpleasant too, so they likely won't take more than one bite before moving on. Bobbex Deer is safe for use on most sensitive plants, is harmless to all wildlife, humans, pets, birds and aquatic life, and won't wash off in rain or from watering. In testing, the Connecticut Agricultural Experiment Station found Bobbex Deer to be 93 percent effective, second only to a physical barrier for preventing deer damage. To learn more about Bobbex Deer and Bobbex-R, for small animals, please visit www.bobbex.com.